The network value to transaction ratio (NVT ratio) has typically been a good barometer for tracking market movement. NVT signal is a very slight variation of the NVT ratio whereby a cryptoasset’s network value is divided by the 90-day moving average of daily on-chain transaction value (rather than simply daily on-chain transaction value for NVT). 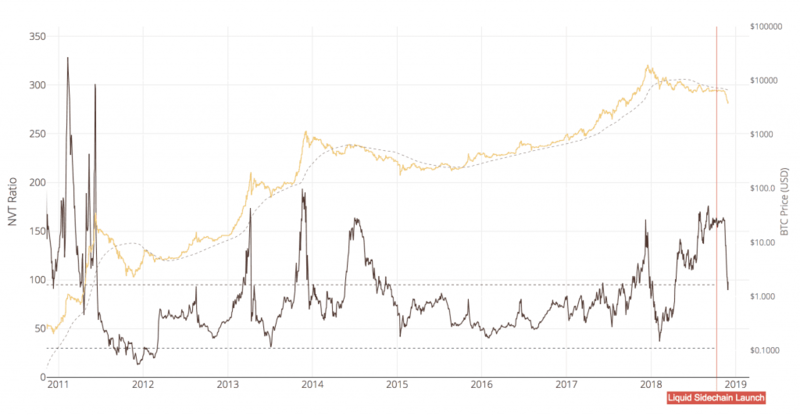 The NVT ratio of bitcoin (brown line) has historically shown a very tight correlation between the value transmitted by the chain (on chain volume) and network value (market cap). For bitcoin, anything above 120 would indicate the overbought zone and below 50, oversold. For the past 6 months, the NVT signal has been in inflated territories, consistently above the 120 level, indicating that transaction volumes, (or lack of), did not justify bitcoin’s price. However, for the first time in months, due to a combination of increased transaction volume and price reconciliation, the past week has seen the NVT signal begin to normalize. Another important leading indicator is bitcoin network momentum. Based on the simple premise that volumes are tied to price movement, bitcoin network momentum is simply the analysis of on-chain transaction volumes. Instead of measuring volume in USD adopted by NVT signal, the momentum indicator uses the bitcoin daily volume, measured in bitcoin. Bitcoin network momentum suggests that there needs to be a period of gathering momentum in transaction volumes, before the next bull market can take place. A period of declining volume usually coincides with the early stages of a bear market, with gathering momentum suggesting that the next bull market is around the corner. Current data shows that bitcoin volumes have most likely bottomed out. Growth in bitcoin volume or “momentum” would suggest that we are entering the late stages of the bear market. Historical data points indicate that a return to 200,000+ BTC daily volume would indicate that we are in the throngs of a revitalized bull market. Although NVT and momentum as trading signals are still experimental, they can be helpful in framing stages of market cycles and where might currently lie within those cycles. As noted a couple of weeks ago, the length and drawdown severity of past bear market cycles suggest that there is still sideways chop to come. A bear market is defined as when the 200-day moving average is above the spot price of bitcoin. 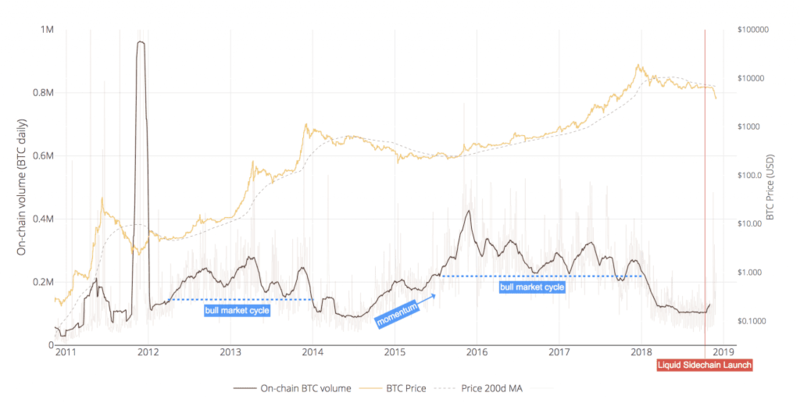 By this definition we have been in a bear market since March, lasting approximately 270 days thus far, with an 82% drawdown from bitcoin’s all time high (ATH). Based on the fact that the past two major bear markets resulted in an 87% decline from ATHs over 429 days in 2014/15 and 94% decline from ATHs over 275 days in 2011/12, we may be nearing the late stages of the bear market but are not completely out of the woods yet. Furthermore, the market is still highly correlated; one look at SIFR data’s correlation matrix shows that the wider crypto market still largely trades in lockstep with bitcoin. We have many altcoins of questionable value still trading at ridiculous levels and projects with large amounts of supply locked up still trading at over-inflated valuations. For example, based on the total supply of XRP, Ripple is still trading as a $40 billion network/company, 60% of which, is still owned by Ripple as a central entity. This is more than the value of U.S. airlines, Delta and Southwest Airlines; companies with real cash flows and clear demand. I’m still looking for total capitulation in some tokens and valuations to consolidate to rational levels. Until we see a flight to quality, we are unlikely to see upward momentum. Based on the above reasoning and the fundamental indicators, it’s likely that we are at least two-thirds of the way through the correction. That said, downbeat sentiment and periods of 70-90% drawdowns from euphoric highs have historically presented strong buying opportunities for bitcoin and the cryptoasset space as a whole. For an indication of the end of a full market detox, I will be looking for the NVT ratio to continue to consolidate, gathering momentum in bitcoin transaction volumes and a flight to quality amongst cryptoassets. It’s worth noting that once the bull market comes knocking, it’s highly unlikely that we will be flying up the curve. 2019 is likely to see a slow, emphasis slow grind upward. The SEC is going after violators (including Floyd Mayweather and DJ Khaled) who flouted regulations pertaining to securities offerings in the ICO craze of 2017-18. Google’s trend explorer reveals the weekly number of worldwide searches for the keyword “bitcoin” has reached levels not seen since April. CoinShares estimates that 77.6% of bitcoin mining uses renewable energy. Although his firm, Galaxy Digital has lost over $136 million this year, Mike Novogratz remains bullish in the long term, “I fundamentally think you’re going to see big adaption in 2019, 2020". A crypto ETF approval won’t happen until market manipulation stops; in his speech at Consensus: Invest, SEC Chairman, Jay Clayton, made it clear what roadblocks the market needs to clear before an ETF will get approved. Everything you need to know about Crypto in 2019 from Bloomberg.